Size of Male: 35-45 lbs., 13-15 in. Size of Female: 35-45 lbs., 13-15 in. Although he has a somber face, the Sussex Spaniel can be quite a clown in the home. Friendly and cheerful, these dogs make excellent family companions. They love spending time with their families. They love children and they get along well with other dogs and pets. The breed was created in the 18th century to flush and retrieve upland gamebirds. They are a very good dog for people hunting on foot. Since they are short and low to the ground, they work slowly but they are very good hunters. Today, the Sussex is mainly kept as a pet. The Sussex Spaniel was first bred in Hastings, East Sussex, by Mr. Fuller of Rosehill Park in 1795. He was trying to breed dogs for the rough terrain and dense undergrowth of the area. 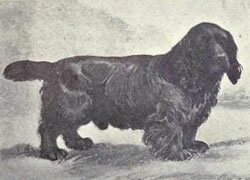 It’s believed that he crossed the liver and white Norfolk Spaniel (extinct now), the Field Spaniel, and some Springer Spaniels to produce the Sussex. The dog needed to be long and low to the ground and he also wanted a dog that would bark when it found game, since it might not be seen in the undergrowth. The Sussex became very popular with sportsmen who needed a dog with these traits, especially since hunting was carried out on foot. A slow-working dog was an asset. This dog breed was one of the first 10 breeds admitted to the AKC when it began in 1884. However, the Sussex lost popularity later, as faster dogs came to be preferred. In England the dog nearly became extinct following World War II but was saved by the efforts of breeders. Only 10 of these dogs were registered there in 1947. Today the breed is designated as a Vulnerable Native Breed in Britain, meaning that less than 300 dogs are registered per year. In 2008, only 56 puppies were registered. The breed is somewhat more popular in the U.S. and in 2009 a Sussex Spaniel with the name of Ch. Clussexx Three D Grinchy Glee (or “Stump”) was Best In Show at the Westminster Kennel Club show. Although they are slow-paced dogs in the field, at home the Sussex Spaniel can be quite clownish and energetic. Wave a treat and they will come running. However, they are usually very calm dogs. They love people, especially children. They can also be somewhat protective of their families. They are said to make very good therapy dogs. They are cheerful dogs and they generally get along with other dogs and pets. When it comes to strangers, the Sussex can be reserved, especially compared to other spaniels. This is an intelligent dog breed and can be a quick learner but they can also be stubborn at times, which can make dog training more difficult. This dog does like to bark, so you will need to teach him to stop. These dogs also drool, so be prepared. Living Environment – The Sussex Spaniel makes a fine apartment dog as long as he gets enough exercise. They are medium-sized dogs and relatively calm most of the time. They can be barkers but you can teach them to stop barking. They will also enjoy having their own yard to play in. They do not do well as kennel dogs and want to be with their people at all times. Grooming – Grooming for this dog breed isn’t difficult. They need to be brushed a couple of times per week to prevent matting, with special attention paid to their long ears. Clean the ears regularly to prevent ear infections. Trim the hair around the paws occasionally to prevent them from tracking dirt and mud in the house. Diet & Exercise – Dietary requirements are normal. However, these dogs can gain weight easily so you should carefully monitor how much they eat and feed controlled portions. Make sure they get plenty of exercise. They will enjoy a good run but be careful about letting them run off-leash. They can follow a scent and not return when you call. Health – Health wise, they can be prone to canine hip dysplasia, ear infections, and pulmonary valve stenosis (a heart problem). They are also prone to patent ductus arteriosus, tetralogy of Fallot, another heart problem, and intervertebral disc syndrome or spinal disc herniation (a back problem). If you are interested in this dob breed you should talk to a breeder about possible dog health problems. The Sussex Spaniel is considered an intelligent dog and they like to please their owners. They are very sweet, gentle dogs. However, they can be stubborn at times, which makes dog training more difficult. Fortunately, these dogs are usually very food-motivated. Find ways to get them interested in training and make training fun for them. Do not use harsh training methods. Instead, use positive dog training methods (praise, reward) and you should be able to train your dog without too much difficulty. We came across the beautiful Sussex Spaniel breed at a dog show at the Cow Palace in San Fran 3 years ago, and fell in love.